Lesbos Island Greece, Nov 14, 2015. A rubber dinghy carrying several dozen migrants and refugees, mainly from Afghanistan, Syria, Iraq and Iran, approaches a rocky beach of Lesbos island. The photograph of three-year old Alan Kurdi’s body washed up on a Turkish beach last September spurred a wave of international outrage. Back then, the UN Refugee Agency estimated that over 380 000 refugees had made their way to Europe within the past nine months. Since then, the number has grown to over a million. Many are coming from the war-torn nations of Syria, Afghanistan, and Iraq. 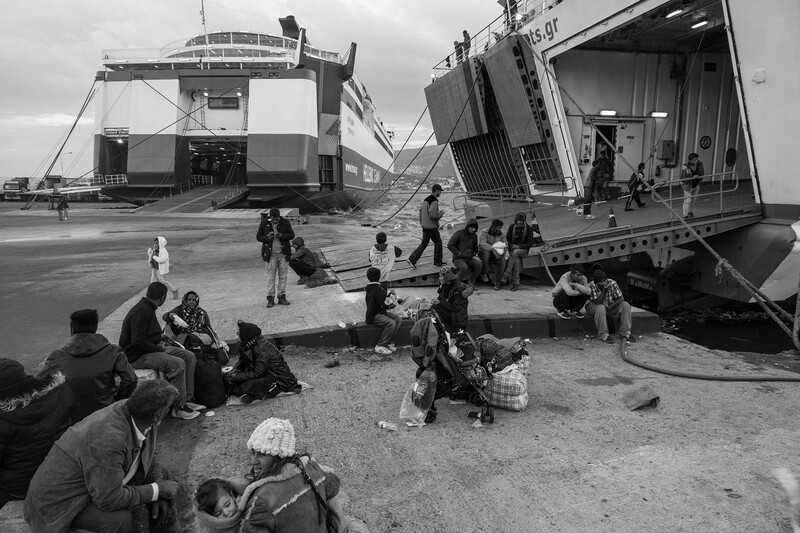 Unable to watch the situation unfold from his living room, Canadian photographer Roger Lemoyne, known for his work covering the horrors of the Yugoslav Wars, spent two weeks in November 2015 between the island of Lesbos in Greece – where thousands of migrants arrive every day – and Macedonia, one of the many countries they cross on their journey towards the more fortunate nations of Western Europe. 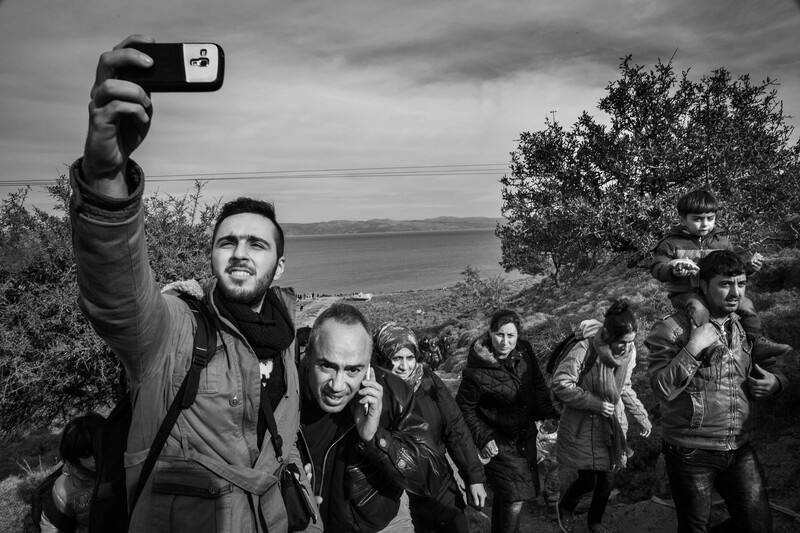 Below, he comments his photographs, and so do Dr. Jen Bagelman, who studies questions of asylum and citizenship, Christopher Tidey from UNICEF, and Sonja Kuiten, a volunteer. Lesbos Island Greece, Nov 16, 2015. 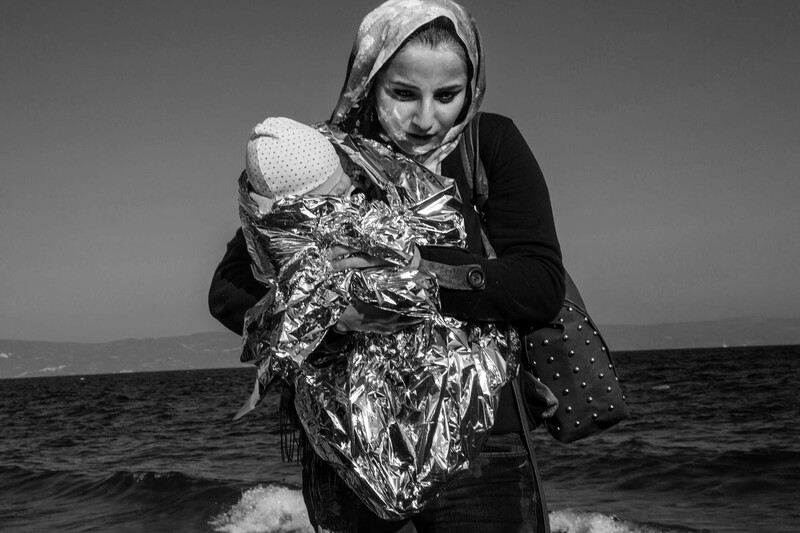 A female refugee who has just crossed from Turkey holds her baby wrapped in thermal blankets. She traveled by rubber dinghy and landed with other members of her family family on the northern shore of the island. A female refugee is attended to by an aid worker of a Dutch organization Stichting Bootvluchteling, moments after a rubber raft carrying 40 to 50 migrants reached the shore of Lesvos island near the town of Skala Skimineas. Lesbos Island Greece, Nov 15, 2015. A young migrant man emerges from the sea after he jumped from his rubber dinghy and saw the last 30 meters to the shore. 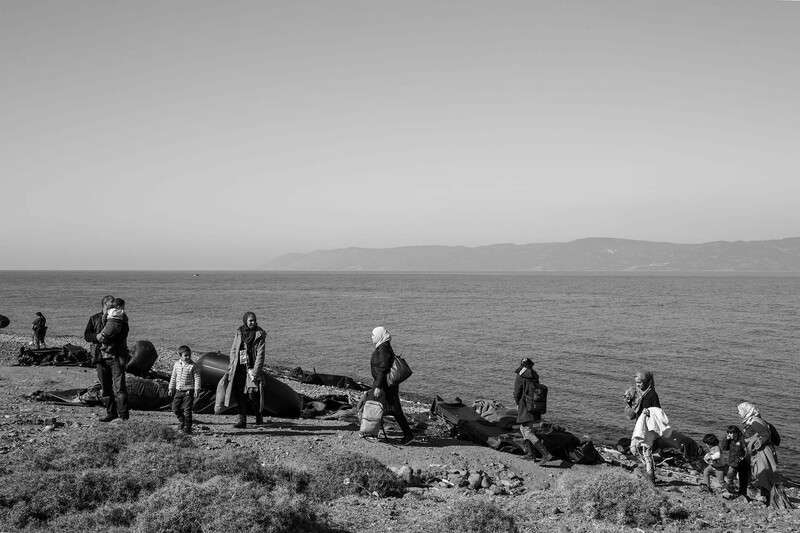 Lesbos Island in Greece, 15 November 2015. Migrants and refugees who have just landed on the island of Lesbos, leave the beach to head for a transit camp a few kilometres from there. We may well be witnessing a paradigm shift in human migration and ultimately, the definition of national borders. Thousands of refugees from Syria, Iraq, Afghanistan and other countries are moving through Turkey to Europe. Many are landing in small boats on the Greek islands, Lesbos being one of those closest to Turkish coast. That is where this European journey begins. it winds through Greece and Macedonia, where my time ran out near the Serbian border. I hope to continue this coverage soon. 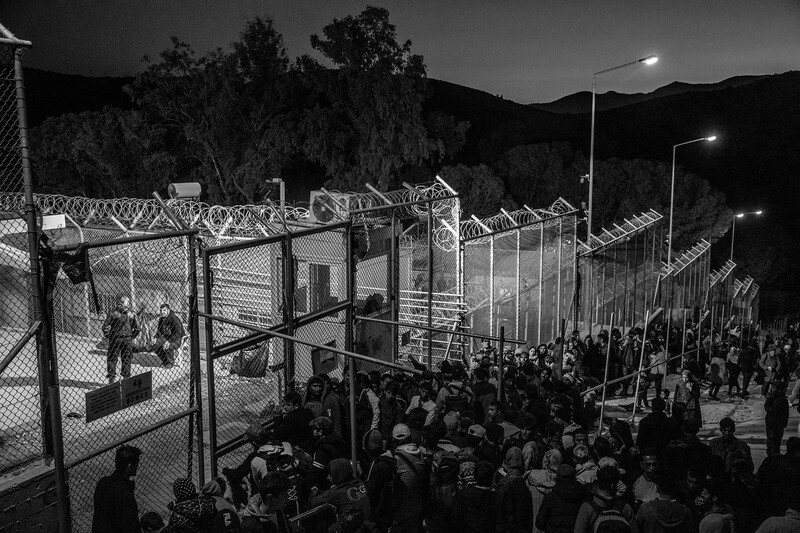 Nov, 2015 hundreds of migrants and refugees wait to be admitted to the Moria transit camp, where they would be registered and receive some new documentation and tickets for onward travel. Lesbos Island in Greece, November 21, 2015. Migrants and refugees are waiting for boarding a Greek ferry that will take them to Mytilene on the island of Lesbos in Athens, the next step in their journey. 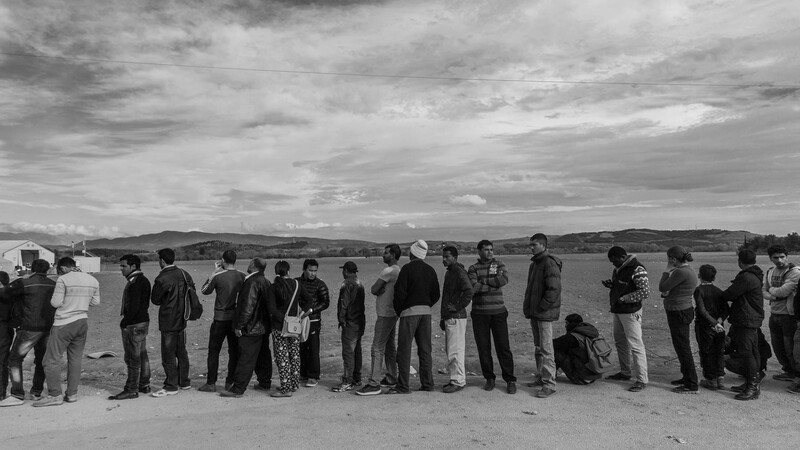 Nov, 2015 Migrants from different countries wait at the transit camp at Eidomeni, Greece. 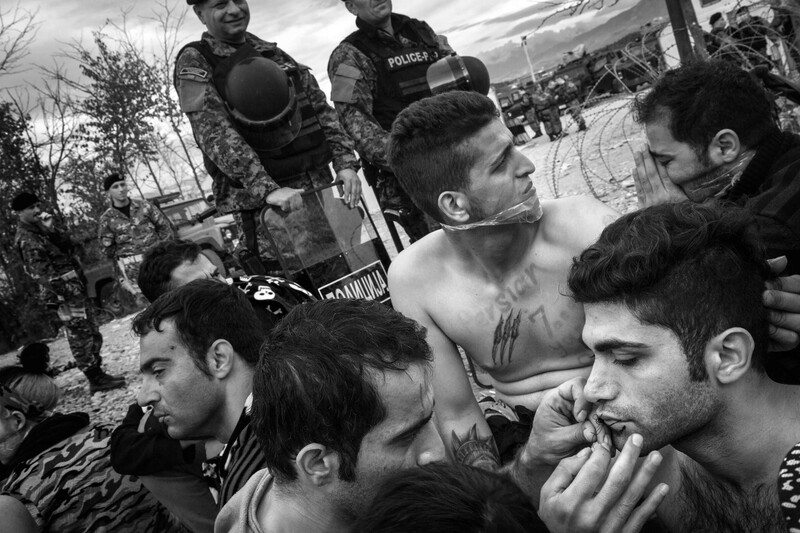 At that time, many nationalities had been denied passage across Macedonia, creating a tense and difficult situation. “This exodus is so different from the other ones I’ve witnessed, whether in the Balkans in the mid-nineties, in the Horn of Africa, following the famines of 1991 and 2001, or more recently in Afghanistan. There’s a profound dissonance between the situation and the type of people who are refugees and who, as such, have come to embody the region’s instability. During the two weeks that I spent in Lesbos and traveling with migrants to the Macedonian border, I encountered members of an educated middle-class, graphic designers, doctors, entrepreneurs. I wondered: ‘How can someone who’s informed, who’s well-read, who has access to technology and who has some financial means be reduced to putting his life in peril crossing a sea on a dinghy, walking through inhospitable lands, waiting, like cattle, at border control centers and boarding trains that are reminiscent of another tragedy? And then, I thought of the role our governments – and by extension ourselves – play: ‘If we’re going to take the refugees in, why can’t we help them cross on-board a decent ferry?’ We’ve come to a point in time, where borders make less and less sense, yet we’re keeping up with this charade of making migrants jump through hoops to reach some semblance of safety and building physical barriers to reaffirm these flailing frontiers. There’s something very wrong with this picture. Nov, 2015 Migrants or refugees from Iran protest their refusal of passage by Macedonia at the transit camp at Eidomeni, Greece. In the foreground a man sews another’s mouth shut with ordinary needle and thread as a form of protest. Behind them stand Macedonian border guards. At that time, many nationalities, including Iranians, had been denied passage across Macedonia, creating a tense and difficult situation. Nov, 2015 Refugees cross from Greece into Macedonia at Eidomeni, Greece. In the foreground are Macedonian border guards. 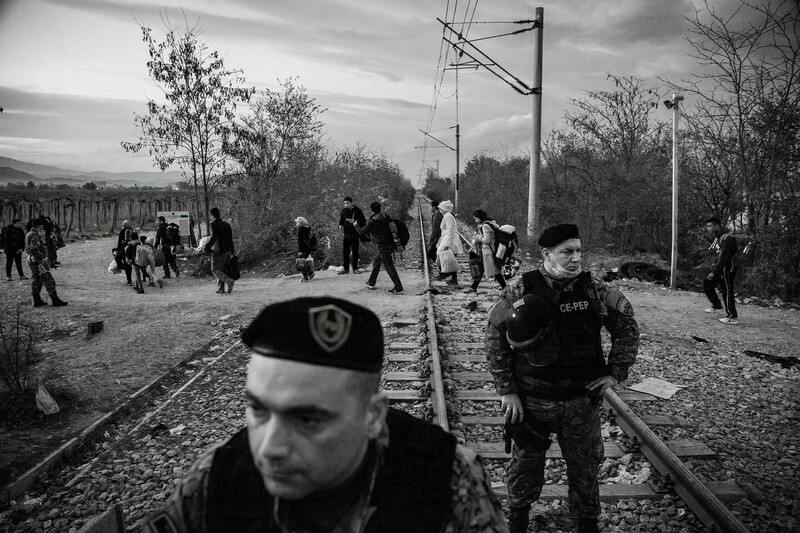 Nov 2015 Refugees from Afghanistan, Syria and Iraq are permitted to board a train that will take them from a Macedonian transit camp on the border with Greece to another camp on the border with Serbia, from where they must travel on foot to Serbia. 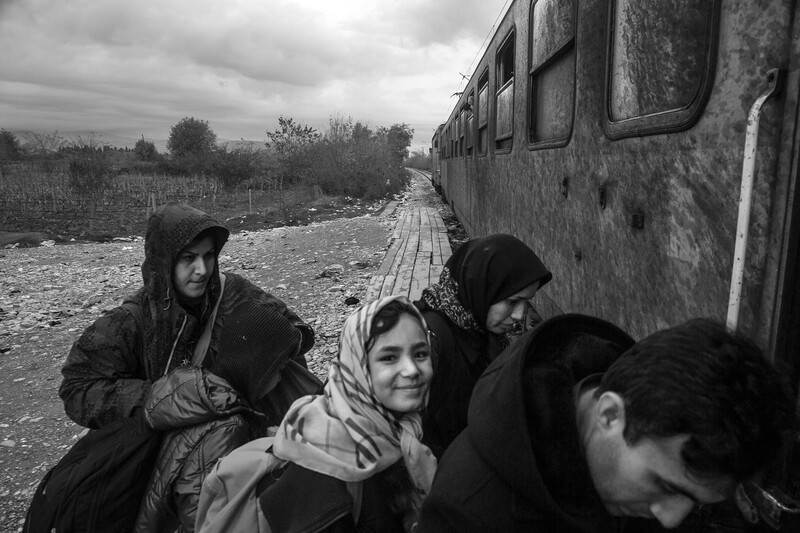 Refugees pay 25 euros for an unheated, overcrowded train ride that lasts about 4 hours and crosses all of Macedonia. 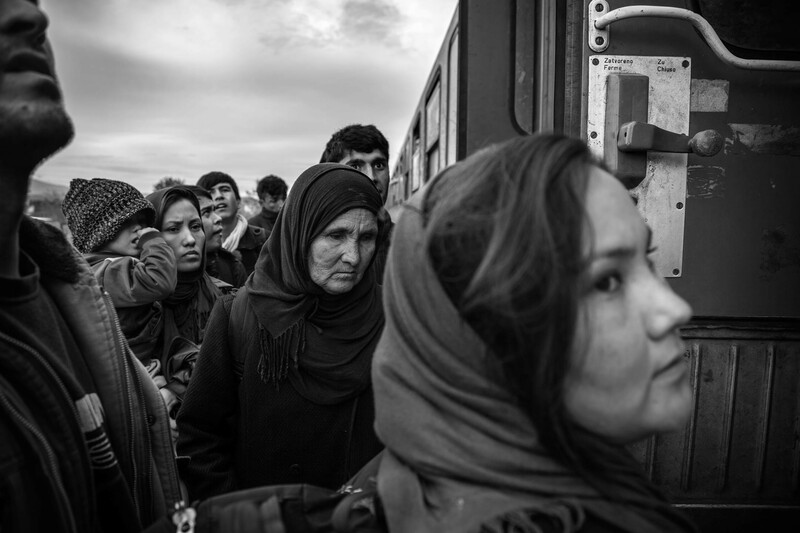 Nov, 2015 Refugees from Afghanistan, Syria and Iraq are permitted to board a train that will take them from a Macedonian transit camp on the border with Greece to another camp on the border with Serbia, from where they must travel on foot to Serbia. Refugees pay 25 euros for an unheated, overcrowded train ride that lasts about 4 hours and crosses all of Macedonia. Gevgelija, Macedonia, November 23, 2015. 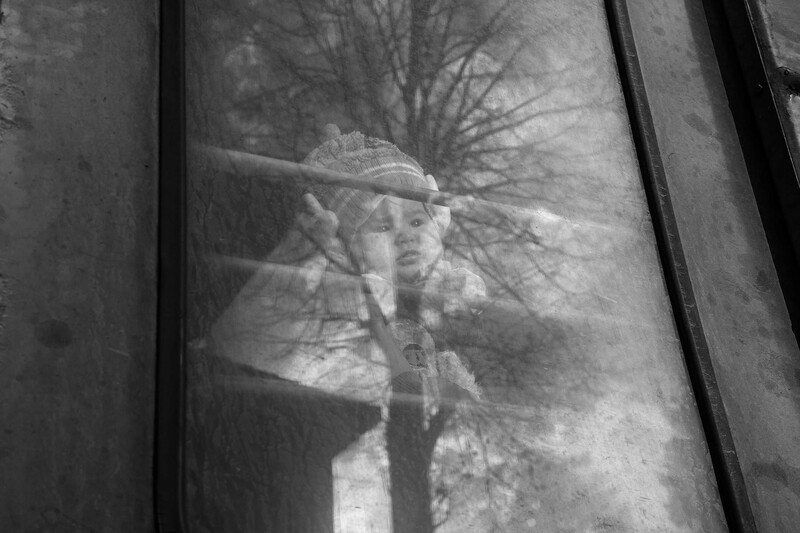 A child is seen through the window of a train full of refugees. The train will take them a Macedonia transit camp to another camp on the border with Serbia to the north. Refugees must pay for this transport run by a private company. 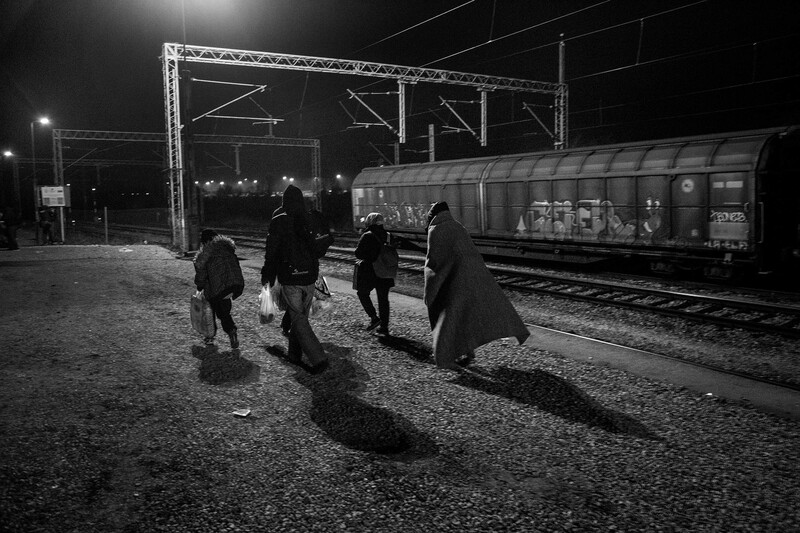 Nov, 2015 Refugees from Afghanistan, Syria and Iraq leave a train that taken them facross Macedonia toTabanovtse on the border with Serbia, from where they must travel on foot about 2 km into Serbia. “I’m not sure this particular movement of people is any different from other current or recent refugee crisis insofar as the motivations are largely the same – the vast majority of people are fleeing from their homes and communities because their lives are at risk. These are the same motivations, which have driven people to flee places like South Sudan, Burundi and the Central African Republic. There are more refugees and internally displaced people now than at any other time since World War II. What seems to be different in the case of the crisis gripping Europe is its scale – more than 900,000 people arrived to Europe by sea in 2015. What this speaks to is the failure to bring peace and stability to countries like Syria, Iraq and Afghanistan. Western countries are also not used to receiving large influxes of refugees and migrants, while countries in other parts of the world (Africa and the Middle East in particular) have been dealing with refugee crises for years or even decades. 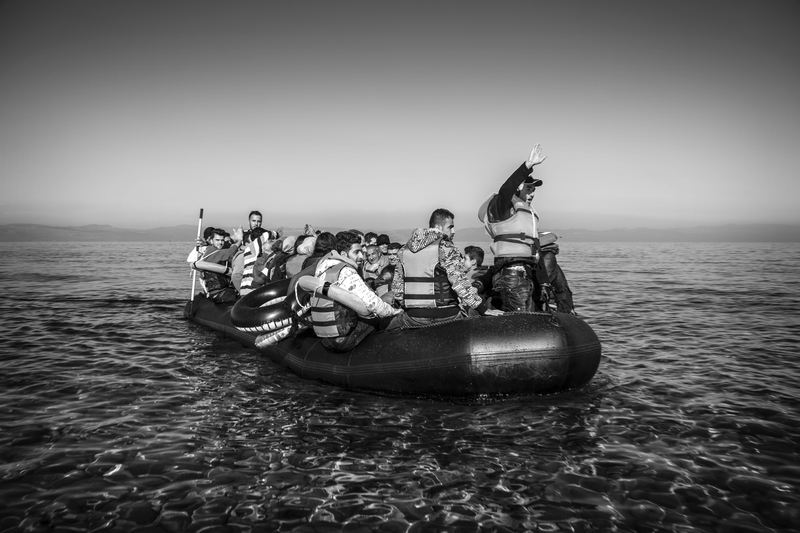 “Global refugee crises are often described in terms of ‘flows.’ What does this word imply? A steady stream, perhaps. When we look at the numbers of people forced to flee their homes we certainly witness shockingly steady increases. But steady is not the word that hits me when I look at Roger Lemoyne’s photos of people crossing the choppy Mediterranean Sea by dinghy. I see precariousness. I see a journey that is erratic, tumultuous and one that is on the edge of death. In these images I also see life. 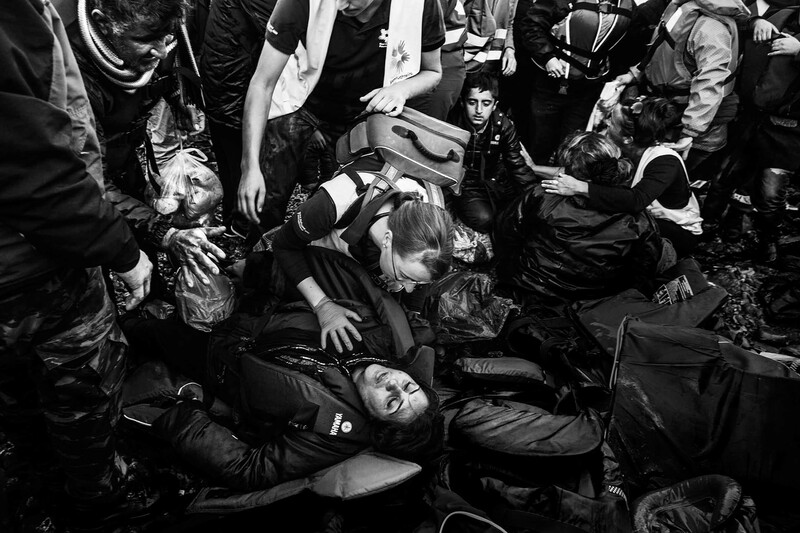 While the stark black and white pictures certainly speak to the horror of global refugee crises they do more than that. Photos like the one of the girl smiling coyly over her shoulder or the one of the man standing shirtless but strong on the beach capture something of the resilience and incredible spirit of people moving under precarious conditions. These photos show that even under incredible pressure, asylum seekers are still taking political voice. They are also taking selfies. We see here how technology is shifting the asylum landscape. Cellphones connect people in an unprecedented and immediate way. In addition to connecting loved ones, digital devices are linking those who are strangers by name, but united in struggle. Mapping tools are being tactically used to identify preferred routes of passage, to inform those who are still yet to come. Since the early 1990’s, Roger LeMoyne has been documenting the human condition in more than 40 countries worldwide. 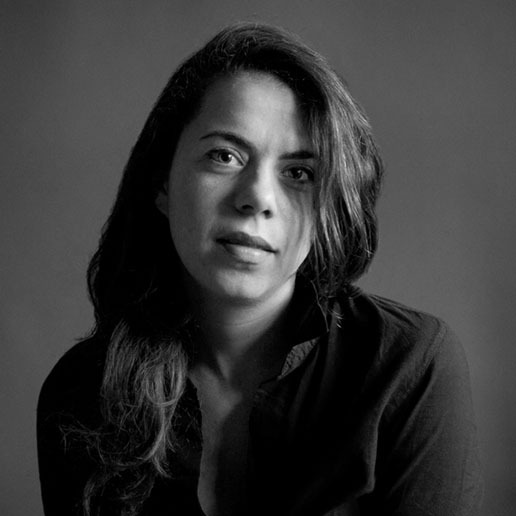 He is the recipient of many major awards including the World Press Photo, a Canada Council grant, CALQ grant, the Michener-Deacon fellowship and others. 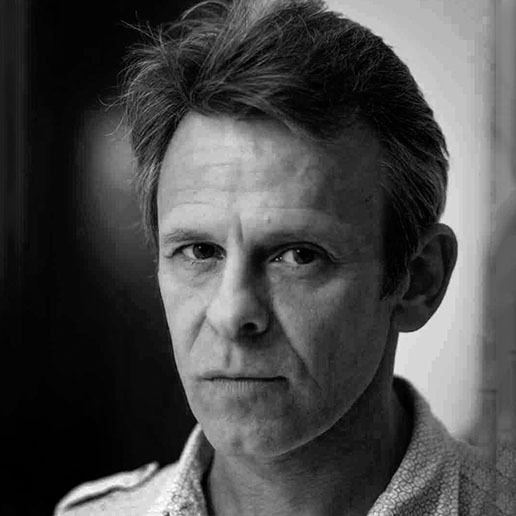 His book “Details Obscurs”, was published in 2005. He lives in Montreal with his wife and their two young children.